Precision was awarded the storage contract for the major new development site for Telecom New Zealand mid 2010. 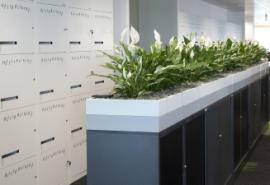 As primary supplier to Telecom, Precision designed a custom range of lockers for storage of personal effects in the hotdesking environment as well as providing Strata Planters to enhance the look of the clients existing tambour storage. In addition, the on floor archival storage solution selected was Compactus, another leading Precision product.